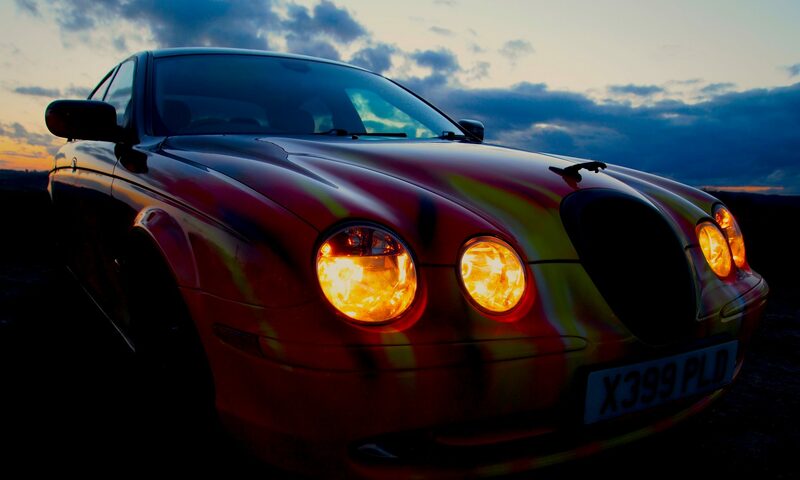 We said goodbye to our gorgeous S-Type Jag this weekend. She has gone to a Jaguar lover in Chorley – so look out for her there. Below are some pictures of her final photo shoot. At ChipsAway Stroud we so badly needed a space to use as an office and a comfortable area for customers to wait in. Our painting workshop is hazardous (and uninsured for visitors) and the only other place for people to wait was outside. We considered our options and got a few quotes for small shed like buildings, dry lined, with electrics, but we just didn’t have the budget. When the idea of a caravan was first raised, we doubted very much whether this would “add” to the customer experience. In my imagination, I thought of a 1970’s car lot, next to the scrap yard, with a cigar smoking, sheepskin wearing, used-car salesman in residence. In any case, decent caravans we looked at, seemed out of reach price-wise. Jim and I agreed that anyway we felt that white caravans looked like toasters, so we explored getting one sprayed or wrapped. We knew it was beyond our guns and most vinyl wrappers didn’t want to know – and demonstrated this by quoting thousands of pounds for the job. In the end we bought a caravan and did both – we used Colour Catch Liquid Wraps who sprayed the van we bought using a liquid vinyl product. Our black van looks great now and certainly attracts a lot of attention! The next job was to completely gut the interior to transform it into a useable office space. I foolishly offered the existing fittings free to anyone who wanted to help. Some of the free-cyclers were like vultures and came and stripped out anything worth having – even removing the electric box I had specifically asked them not to. They left behind a mess of wires and just the bigger bits of furniture that held the caravan together. Once we removed the sink, cooker, bathroom walls and most of the seating, we looked at how to build structure back into the space and reinforced the sides and roof with wooden supports. Our friends at Cotswold Connections did a brilliant job, sorting out the electrics – giving us two new lights, a wealth of double sockets, and install a hook up. Then we decided to make it black inside too. We sprayed the surrounds for the blinds black and painted all the walls. New plywood was laid on the floors and painted with black floor paint. We sourced some seats on eBay from a Hyundai Coupe, and picked them up from a man in Woodchester and mounted them on a pair of Fiat Panda wheels that we had in the workshop. We decided to keep a bench for seating at one end and I covered a single mattress in leatherette and found some cushions online that looked like they might belong. I also bought a broken Porsche alloy on eBay for pennies, I refurbished it and bought a circular piece of glass for the top – probably the most expensive item in the caravan! The only thing left was to move in our desk, a display case, and new desk chair and start work. In the hottest summer for decades. In a black caravan. We very quickly rushed out and bought a portable air conditioner – which was white, so we sprayed it with left over black metallic car paint. Have a look at the slideshow below. I’ve uploaded a short video of the caravan to give you more of an idea. And if you are passing ChipsAway on the Ryeford Industrial Estate, feel free to call in and have a look at the inside as well as the outside! Having seen my hot S-Type Jaguar and a respray I did of a friend’s motorbike fuel tank, a local biker got in touch with a very special request. When I finished the Jaguar project I told myself next time I painted fire, I wanted to go for the classic hot rod flame job, rather than free-hand organic kind. I hadn’t realised the opportunity would arise so quickly. When the tank, mud guard and rear fender arrived, it had the original black paint on it, but had been crudely embellished with white vinyl, that hadn’t really weathered very well. Worse, when I removed the vinyl, it had clearly been cut to shape after it had been laid on the bodywork – the person who did it had sliced straight into the paintwork, drawing the flame outline with a blade. Once the vinyl was removed the paintwork had to be flatted back and ground out where areas of rust appeared. The owner wanted to change from black and white to red and yellow (gold), so it was quite a job. After priming the parts, it went red and that’s when the real research started. I found very few people left in the UK who custom paint these days, vinyl wraps have killed the skill, so I turned to the home of the hot rod – the USA. I had previously taken advice from master free-style fire painter, Steve Wisniewski of Royal Reign Artistry but I found a wealth of new friends offering advice online on the classic flame, including the talented Dave Webster of Identity Crisis Design. I read lots of advice by Craig Fraser who has been in the business for years, and ran a number of testers before finally feeling ready to start. This is not a “how to” blog, as I am still very much in the infancy of my custom work for that. But here are a few photos of the process. Once painted, pearlescent gold was flicked over the yellow and rich drop shadows added, Jim helped me lacquer (as it was by now about 10.00pm)! We revisited early the next morning to flat and polish and I handed over the parts to a very happy owner a few days later. The owner has just sent a photo of the bike reassembled! It would certainly look good on a ride out with my S-Type! Look out for both out and about in Gloucestershire, England! Feel free to contact me for information and ideas!